Our gorgeous nigella orientalis ball table top topiary centerpiece carries the unmistakable influence and graciousness of the artificial ball topiary and topiary decorations starting in the late Elizabethan era. Topiary centerpieces of dried nigella orientalis could easily sit in any proper English cottage and are a delightful flower topiary addition to any modern-day interior. Our selection of preserved topiary florals feature nigella orientalis pods, which are buttressed against one another to completely cover this artificial ball topiary form. These designer topiaries, encapsulated with dried nigella, are placed in a weathered table topiary tin base and embellished with our gracious southern staple: refined Spanish moss rising from and cascading out of the nigella topiary base. Our table top topiaries of nigella orientalis pose a unique floral design and create a topiary design effect akin a sea of to floral ‘stars’ fashioned over the entire artificial ball topiary base. 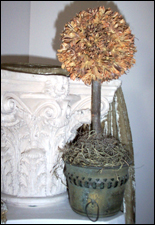 Our dried faux topiary centerpieces are graceful paragons to ancient nigella topiary and the art of preserved topiaries. Purchase a singular topiary centerpiece of or more than one of our gracious nigella orientalis ball table top topiary centerpieces to impart a beautiful design statement with graceful and charming decorative topiaries in any interior!